Difference between revisions of "Gautama Buddha"
'''Gautama Buddha''', the “Compassionate One,” holds the office of Lord of the World (referred to as “God of the Earth” in Rev. 11:4), hierarch of the [[etheric retreat]] at [[Shamballa]] (over the Gobi desert), where he sustains the [[threefold flame]] of Life for the evolutions of Earth. Gautama (who was embodied as Siddhartha Gautama c. 563 <small>B</small>.<small>C</small>. ), is the great teacher of enlightenment through the soul’s mastery of the Ten Perfections, the [[Four Noble Truths]], and the [[Eightfold Path]], and sponsor of [[Summit University]] and of the mission of the [[Mother of the Flame]] to carry the torch of illumination for the age. '''Gautama Buddha''', the “Compassionate One,” holds the office of [[Lord of the World]] (referred to as “God of the Earth” in [[Book of Revelation|Revelation]] 11:4), hierarch of the [[etheric retreat]] at [[Shamballa]] (over the Gobi desert), where he sustains the [[threefold flame]] of life for the evolutions of Earth. Gautama (who was embodied as Siddhartha Gautama c. 563 <small>B</small>.<small>C</small>. ), is the great teacher of enlightenment through the soul’s mastery of the Ten Perfections, the [[Four Noble Truths]], and the [[Eightfold Path]], and sponsor of [[Summit University]] and of the mission of the [[Mother of the Flame]] to carry the torch of illumination for the age. Gautama came in an hour when Hinduism was at its worst state of decadence. The priesthood was involved in favoritism and guarding the great secrets, the real mysteries of God, from the people, thus keeping the masses in ignorance. The caste system had become a means of imprisonment of the soul instead of a means of liberation through dharma. Born as Prince Siddhartha, he left palace, power, wife and son to gain that enlightenment whereby he could give back to the people that which the interlopers had taken from them. First he encountered a very old man, gray and decrepit, leaning on a staff; second, a pitiful one racked with disease, lying in the road; third, a corpse; and fourth, a yellow-robed monk with shaved head and a begging bowl. Much moved with compassion by the first three sights, he realized that life was subject to old age, disease, and death. The fourth sight signified to him the possibility of overcoming these conditions and inspired him to leave the world he knew in order to find a solution for suffering. One day Sujata, a villager’s daughter, fed him a rich rice milk—a “meal so wondrous ... that our Lord felt strength and life return as though the nights of watching and the days of fast had passed in dream.”<ref>Edwin Arnold, ''The Light of Asia'' (London: Kegan Paul, Trench, Trubner & Co., 1930), p. 96.</ref> And then he set out alone for the Bo tree (abbreviation for bodhi, or enlightenment) at a place now called Buddh Gaya, or Bodh Gaya, where he vowed to remain until fully illumined. Hence, it has become known as the Immovable Spot. At that point, Mara, the Evil One, attempted to prevent his enlightenment and confronted him with temptations much in the same manner that Satan tested Jesus during his fasting in the wilderness. At that point, [[Mara]], the Evil One, attempted to prevent his enlightenment and confronted him with temptations much in the same manner that [[Satan]] tested [[Jesus]] during his fasting in the wilderness. Thus, he attained Enlightenment, or the Awakening, during the night of the full-moon day of the month of May, about the year 528 <small>B</small>.<small>C</small>. His being was transformed, and he became the Buddha. For a total of forty-nine days he was deep in rapture, after which he again turned his attention to the world. He found Mara waiting for him with one last temptation: “How can your experience be translated into words? Return to Nirvana. Do not try to deliver your message to the world, for no one will comprehend it. 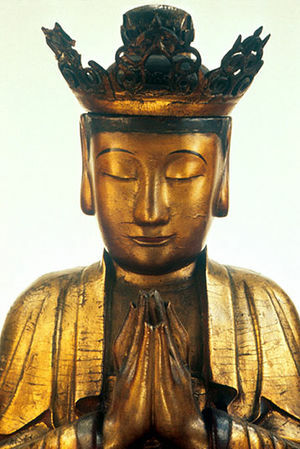 Remain in bliss!” But Buddha replied: “There will be some who will understand,” and Mara vanished from his life forever. At the age of eighty, Gautama became seriously ill and almost died, but revived himself, thinking it was not right to die without preparing his disciples. By sheer determination, he recovered and instructed Ananda, his cousin and close disciple, that the order should live by making themselves an island—by becoming their own refuge and making the ''Dhamma'' their island, their refuge forever. At the age of eighty, Gautama became seriously ill and almost died, but revived himself, thinking it was not right to die without preparing his disciples. By sheer determination, he recovered and instructed [[Ananda]], his cousin and close disciple, that the order should live by making themselves an island—by becoming their own refuge and making the ''Dhamma'' their island, their refuge forever. After announcing that he would die in three months, he traveled through several villages and then stayed with Cunda, the goldsmith, one of his devoted followers. According to generally accepted tradition, Cunda invited Gautama to partake of ''sukara-maddava''—a dish he had prepared unknowingly with poisoned mushrooms. After the meal, Gautama became violently ill, but bore his pain without complaint. His only concern was to console Cunda, who might feel responsible for his death. And thus, he compassionately asked Ananda to tell Cunda that of all the meals he had eaten, only two stood out as special blessings—one was the meal served by Sujata before his enlightenment, and the other was the food from Cunda which opened the gates to his transition. His only concern was to console Cunda, who might feel responsible for his death. And thus, he compassionately asked Ananda to tell Cunda that of all the meals he had eaten, only two stood out as special blessings—one was the meal served by Sujata before his enlightenment, and the other was the food from Cunda which opened the gates to his [[transition]]. He passed during the full-moon of May, c. 483 <small>B</small>.<small>C</small>., after again advising Ananda that the ''Dhamma''—the Truth—must be his master and reminding the monks of the transiency of all conditioned things. Gautama Buddha was the first initiate to serve under Sanat Kumara, hence the one chosen to succeed him in the office of Lord of the World. On January 1, 1956, Sanat Kumara placed his mantle on Lord Gautama, whereupon the Chela par excellence of the Great Guru also became the hierarch of Shamballa. Gautama Buddha was the first initiate to serve under [[Sanat Kumara]], hence the one chosen to succeed him in the office of Lord of the World. On January 1, 1956, Sanat Kumara placed his mantle on Lord Gautama, whereupon the Chela par excellence of the Great Guru also became the hierarch of Shamballa. Gautama Buddha today holds the office of Lord of the World (referred to as “God of the Earth” in Revelation 11:4). At inner levels, he sustains the threefold flame of life, the divine spark, for all children of God on earth. Gautama Buddha’s keynote is “Moonlight and Roses.” The “Ode to Joy” from Beethoven’s Ninth Symphony also gives us direct attunement with the Lord of the World. Gautama Buddha, the “Compassionate One,” holds the office of Lord of the World (referred to as “God of the Earth” in Revelation 11:4), hierarch of the etheric retreat at Shamballa (over the Gobi desert), where he sustains the threefold flame of life for the evolutions of Earth. Gautama (who was embodied as Siddhartha Gautama c. 563 B.C. ), is the great teacher of enlightenment through the soul’s mastery of the Ten Perfections, the Four Noble Truths, and the Eightfold Path, and sponsor of Summit University and of the mission of the Mother of the Flame to carry the torch of illumination for the age. Gautama Buddha, was born Siddhartha Gautama in northern India. He was the son of King Suddhodana and Queen Mahamaya, rulers of the Sakya kingdom, and thus a member of the Kshatriya (warrior or ruling) caste. Ancient Pali texts and Buddhist scriptures record that before his birth, his mother, Mahamaya, dreamt that a beautiful silver-white elephant entered her womb through her side. Brahmins, called to interpret the dream, foretold the birth of a son who would become either a universal monarch or a buddha. During the last days of her pregnancy, the queen began a journey to Devadaha to visit her parents, as was the custom in India. On the way she stopped with her attendants at Lumbini Park and reached for a flowering branch of a sal tree. There, under the blossoming tree, the Buddha was born on the full-moon day of the month of May. On the fifth day following the birth, 108 Brahmins were invited to a name-giving ceremony at the palace. The king summoned eight of the most learned from among these to “read” the child’s destiny by interpreting his bodily marks and physical characteristics. Seven agreed that if he remained at home, he would become a universal king, unifying India; but if he left, he would become a buddha and remove the veil of ignorance from the world. Kondañña, the eighth and youngest of the group, declared he would definitely become a buddha, renouncing the world after seeing four signs—an old man, a diseased man, a dead man, and a holy man. The child was named Siddhartha, or “One Whose Aim Is Fulfilled.” Seven days after his birth, his mother passed on and he was raised by her sister Mahaprajapati, who later became one of his first female disciples. The king, concerned about the Brahmins’ predictions and the possibility of losing his heir, took every precaution to shelter his son from pain and suffering, surrounding him with every conceivable luxury, including three palaces and forty thousand dancing girls. At sixteen, after proving his skill in a contest of arms, Prince Siddhartha married his beautiful cousin Yasodhara. He soon grew pensive and preoccupied, but the turning point of his life did not occur until the age of twenty-nine, when he set out on four journeys which presented in turn the four passing sights. On his way back to the palace, he received news of the birth of his son, whom he named Rahula, or “obstacle.” That night he ordered his charioteer to saddle his favorite horse, Kanthaka. 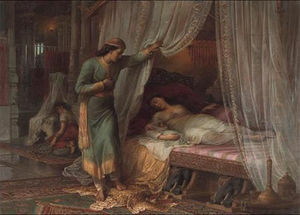 Before leaving the city, he went to the bedchamber for a farewell look at his sleeping wife and son. He then rode all night and at dawn assumed the guise of an ascetic, exchanging clothes with his charioteer, whom he sent back to his father’s palace. Thus, Gautama began the life of a wandering monk. Immediately he went in search of the most learned teachers of the day to instruct him in truth, quickly mastering all they taught. Unsatisfied and restless, he determined to find a permanent truth, impervious to the illusions of the world. Traveling through the Magadha country, he was noticed for his handsome countenance and noble stature. He arrived at a village called Senanigama, near Uruvela, where he was joined by a group of five ascetics, among whom was Kondañña, the Brahmin who had foretold his Buddhahood. As a consequence of these severe bodily mortifications, Gautama became so weak that he once fainted and was believed to be dead. Some accounts describe how he was found collapsed by a shepherd boy who restored him with drops of warm milk. Others say it was the devas, or gods, who revived him. Realizing the futility of asceticism, Gautama abandoned his austerities to seek his own path of enlightenment—whereupon his five companions rejected and deserted him. 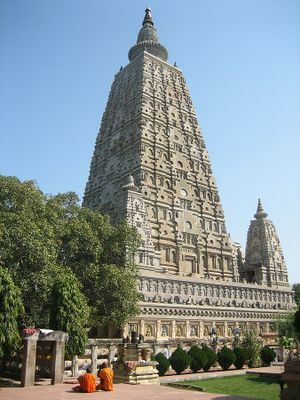 The Mahabodhi temple in Bodhgaya, India. The tree under which the Buddha attained enlightenment is on the left. One day Sujata, a villager’s daughter, fed him a rich rice milk—a “meal so wondrous ... that our Lord felt strength and life return as though the nights of watching and the days of fast had passed in dream.” And then he set out alone for the Bo tree (abbreviation for bodhi, or enlightenment) at a place now called Buddh Gaya, or Bodh Gaya, where he vowed to remain until fully illumined. Hence, it has become known as the Immovable Spot. Unmoved, he sat under the Bo tree while Mara continued her attack—first in the form of desire, parading voluptuous goddesses and dancing girls before him, then in the guise of death, assailing him with hurricanes, torrential rains, flaming rocks, boiling mud, fierce soldiers and beasts—and finally darkness. Yet still, Gautama remained unmoved. As a last resort, the temptress challenged his right to be doing what he was doing. Siddhartha then tapped the earth, and the earth thundered her answer: “I bear you witness!” All the hosts of the Lord and the elemental beings responded and acclaimed his right to pursue the enlightenment of the Buddha—whereupon Mara fled. Thus, he attained Enlightenment, or the Awakening, during the night of the full-moon day of the month of May, about the year 528 B.C. His being was transformed, and he became the Buddha. At the end of the sermon, in which he revealed the key discovery of his quest—the Four Noble Truths, the Eightfold Path, and the Middle Way—he accepted the five monks as the first members of his order. Kondañña was the first to grasp the teaching. At the age of eighty, Gautama became seriously ill and almost died, but revived himself, thinking it was not right to die without preparing his disciples. By sheer determination, he recovered and instructed Ananda, his cousin and close disciple, that the order should live by making themselves an island—by becoming their own refuge and making the Dhamma their island, their refuge forever. After announcing that he would die in three months, he traveled through several villages and then stayed with Cunda, the goldsmith, one of his devoted followers. According to generally accepted tradition, Cunda invited Gautama to partake of sukara-maddava—a dish he had prepared unknowingly with poisoned mushrooms. After the meal, Gautama became violently ill, but bore his pain without complaint. He passed during the full-moon of May, c. 483 B.C., after again advising Ananda that the Dhamma—the Truth—must be his master and reminding the monks of the transiency of all conditioned things. 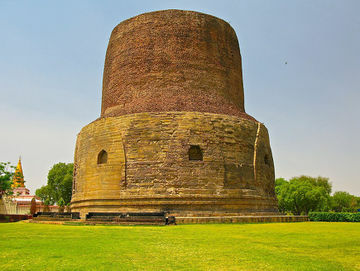 Following the passing of Gautama, Buddhism began to develop in two major directions, leading to the establishment of the Hinayana (“little vehicle”) and the Mahayana (“great vehicle”) schools of Buddhism, from which many further subgroups evolved. The traditional Theravadin outlook centers around the monastic way of life and emphasizes the necessity for self-sacrifice and individual enlightenment in order to help others. Their goal is to become an arhat—perfected disciple—and enter Nirvana. The Mahayanists, who believe that the Theravadins’ strict observance of precepts departs from the true spirit of the Buddha, concentrate more on emulating the Buddha’s life, stressing good works and compassion toward others in the process of gaining enlightenment. The Theravadins, however, claim that the Mahayanists have polluted the pure stream of Gautama’s teaching by incorporating more liberal doctrines and interpretations. The Mahayanists consider their school to be the “greater vehicle,” as it provides more for the layman. Their ideal is to become a bodhisattva—one who attains Nirvana but voluntarily returns to the world to assist others in obtaining the same goal. The Lord of the World does sustain the threefold flame in the evolutions of earth by a filigree light extending from his heart. This, then, is the bypassing of the individual’s karma whereby there is so much blackness around the heart that the spiritual arteries or the crystal cord have been cut off. The comparison of this is seen when the arteries in the physical body become so clogged with debris that the area of the flow of blood becomes greatly diminished until it becomes a point of insufficiency and the heart can no longer sustain life. This is comparable to what has happened on the astral plane. So Sanat Kumara came to earth to keep the flame of life. And so does Gautama Buddha keep this threefold flame at Shamballa, and he is a part of every living heart. Therefore, as the disciple approaches the Path, he understands that its goal is to come to the place where the threefold flame is developed enough here below within his own heart that indeed, with or without the filigree thread from the heart of Gautama Buddha, he is able to sustain life and soul and consciousness and the initiatic path. Beloved ones, this step in itself is an accomplishment that few upon this planet have attained to. You have no idea how you would feel or be or behave if Gautama Buddha withdrew from you that support of the filigree thread and the momentum of his own heartbeat and threefold flame. Most people, especially the youth, do not take into consideration what is the source of the life that they experience in exuberance and joy. I am very observant. I observe you by the contact of my flame through the thread-contact I maintain to the threefold flame of your heart—sustaining it as I do until you pass from the seat-of-the-soul chakra to the very heart of hearts [the secret chamber of the heart], and you yourself are able by attainment to sustain that flame and its burning in this octave. Did anyone here ever recall himself igniting his own threefold flame at birth? Has anyone here ever remembered tending its fire or keeping it burning? Beloved hearts, recognize that acts of love and valor and honor and selflessness surely contribute to this flame. But a higher power and a higher Source does keep that flame until you, yourself, are one with that higher power—your own Christ Self. Therefore, all receive the boost of my heart flame and impetus. And as that light passes through me from the Godhead, I therefore perceive many things about you and your everyday life that you might think beyond mention or notice of a Lord of the World, who must be, indeed, very busy. Well, indeed, I am! But I am never too busy to notice the elements of the Path presented by parents and in families and communities and in the schoolrooms of life everywhere. For I make it my business to see to it that some element of the path of initiation, moving toward the heart of Jesus and Maitreya, is a part of the life of every growing child. Gautama Buddha is the sponsor of Summit University and the hierarch of Shamballa, the etheric retreat of the Lord of the World located over the Gobi Desert. In 1981, Gautama established an extension of this retreat, called the Western Shamballa, in the etheric octave over the Heart of the Inner Retreat at the Royal Teton Ranch. Pearls of Wisdom, vol. 26, no. 4, January 23, 1983. Pearls of Wisdom, vol. 32, no. 30, July 23, 1989. Elizabeth Clare Prophet, Inner Perspectives. ↑ Helena Roerich, Foundations of Buddhism (New York: Agni Yoga Society, 1971), p. 7. ↑ Edwin Arnold, The Light of Asia (London: Kegan Paul, Trench, Trubner & Co., 1930), p. 96. ↑ with the “earth-touching mudra”—left hand upturned in lap, right hand pointed downward, touching earth. ↑ Edward J. Thomas, The Life of Buddha as Legend and History (New York: Alfred A. Knopf, 1927), pp. 66-68, quoted in Clarence H. Hamilton, ed., Buddhism: A Religion of Infinite Compassion (New York: The Liberal Arts Press, 1952), pp. 22–23. ↑ Huston Smith, The Religions of Man (New York: Harper & Row, Harper Colophon Books, 1958), p. 84. This page was last modified on 7 March 2017, at 02:42.